At this time of year Silvereyes must be one of the most abundant birds about in many parts of Tasmania, often in large flocks. They're so common that I rarely even bother to photograph them. So usually when I do I know things must be quiet! In this instance that wasn't quite so. I was making yet another trip to Gould's Lagoon, hoping that the water level had dropped to the point that the crakes might be tempted to feed outside the reed beds. I was particularly after some shots of Spotless Crakes, the shyest of the two species seen at Gould's. I had managed a few distant shots a week or so before, but on this day I was out of luck, scrambling only a few distant shots of an Australian Crake, a species I have frequently photographed here before. The crakes seem to be especially timid at present, perhaps caused by recent cutting of the tall roadside vegetation. There was plenty of other birds to see, including 2 Pelicans and a group of Little Black Cormorants "communally" fishing. A passing Caspian Tern, an infrequent visitor, made a noisy pass at a juvenile Swamp Harrier as it hawked over the lagoon, many Chestnut Teal (including a pair with small ducklings), and the usual Black Duck and Shoveler. A Great Egret roosting with the cormorants was possibly a recent arrival. Finding no 'Spotless' on the main lagoon, I wandered over to the railway embankment where I have occasionally seen them, but more in hope than expectation. So I wasn't disappointed! There were sizeable flocks of Greenfinch and Goldfinch feeding on rose hips and thistle seed heads. There was also a loose flock of Silvereyes, numbering over 50; flocks sometimes number in the hundreds. Walking back along the water's edge, I found myself among a number of tall Fennel plants that had gone to seed. They're a common weed around the Hobart area, growing mainly on disturbed ground, and although they can be eaten, locals rarely bother with them. 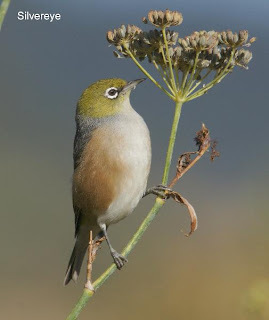 Seeing a small brown job, which turned out to be a Brown Thornbill, I ventured farther into the Fennel where I was soon joined by the Silvereyes. As they soon gave me every opportunity to photograph them, I obliged. Back home with the images on the computer, I was somewhat surprised to notice that they weren't eating the Fennel seeds as I had assumed. Looking closely at the images (such as the one above) I could clearly see that they were after the greenfly and whitefly that was liberally coating the Fennel seed heads. 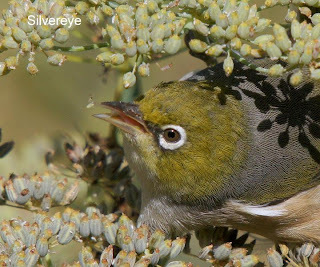 Since many gardeners and grape growers often see Silvereyes as "pests", perhaps finding that they also feed on greenfly and whitefly, they may be looked on just a little more kindly. Your photos just getting better and better. Well done. I appreciate your comment Graeme. However, my striving to get better images (I have a lot of failures) is something of a cleft stick. I now tend to 'blog' only when I have reasonable shots and many of my outings therefore go unrecorded. I do post many more shots on my pbase site--there's a link on the right hand side. It's hard getting a balance and writing isn't my forte.